About 3000 BC, a new wave of Central Asian people migrated west into northern Europe; these were the Indo-Europeans. We also call them the Yamnaya. The Indo-Europeans brought with them new inventions, including woven plaid fabric, and their Celtic language (the ancestor of modern Welsh, Irish, and Breton). They also brought DNA mutations that enabled them (and future Europeans) to drink milk, and to grow taller. They probably brought dogs which replaced most European dogs. A thousand years later, about 2000 BC, there seems to have been a serious drought all across Asia and Africa. 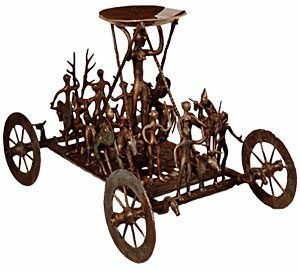 A second wave of Indo-Europeans (Yamnaya) fled from the drought in Central Asia and arrived in Europe, this time with horses and wheeled chariots, and bronze tools. Some of these people headed south and became the Greeks and the Romans. Others stayed in the north, and became the ancestors of the modern Germans, but also of the Franks, Vandals, and Sueves. 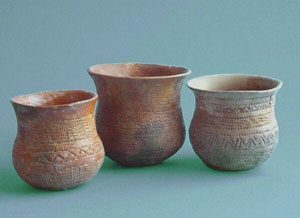 These new people may have also brought a new kind of cup, the Bell Beaker, which people were soon making all over Europe. Some of these people ended up even further north, in Scandinavia (modern Norway, Sweden and Denmark). These are the ancestors of modern Swedes, Norwegians, and Danes. Some of them settled in Poland, where they developed into the Visigoths and the Ostrogoths. These northern people probably were the ones who first started farming oats about 1500 BC. 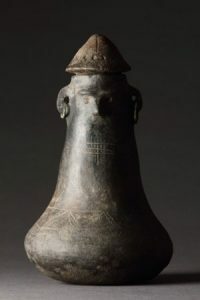 The beginning of the Bronze Age in West Asia encouraged a trade in tin with West Asia, and brought West Asian traders to the northern Mediterranean coast. The Phoenicians and the Greeks built trading posts at Marseilles and Empuries and other places, and traded West Asian glass beads and bronze needles and red dye, and African ivory, for European furs, wood, and slaves. Local chiefs, who now had a lot of cool stuff to give away to their followers, got more popular and then more powerful, and began to have more control over their people. What is the Urnfield Culture? We call this Late Bronze Age European culture the Urnfield culture. Urnfield culture people cremated their dead and buried their ashes in pottery urns. The idea of cremation seems to have spread west across Europe from Hungary. The population of Europe kept on growing. The drought that probably caused the collapse of the West Asian and North African civilizations at the end of the Bronze Age didn’t have such a dramatic effect on Europeans. But when the West Asian traders returned about 1000 BC, they came with iron tools, and began the Iron Age in Europe. Learn by doing: consider the relationship between West Asian trade with Europe, and European trade with West Africa during the 1400s and 1500s AD. Cite this page: Carr, K.E. Bronze Age in northern Europe. Quatr.us Study Guides, June 27, 2017. Web. April 24, 2019. The About the Author box on this page provides a way to reach me through Instagram, Twitter, or Facebook; will that work? Or my email address is available on the University website. Looking forward to hearing from you!